We introduce the itinerant list update problem (ILU), which is a relaxation of the classic list update problem in which the pointer no longer has to return to a home location after each request. The motivation to introduce ILU arises from the fact that it naturally models the problem of track memory management in Domain Wall Memory. Both online and offline versions of ILU arise, depending on specifics of this application. First, we show that ILU is essentially equivalent to a dynamic variation of the classical minimum linear arrangement problem (MLA), which we call DMLA. Both ILU and DMLA are very natural, but do not appear to have been studied before. 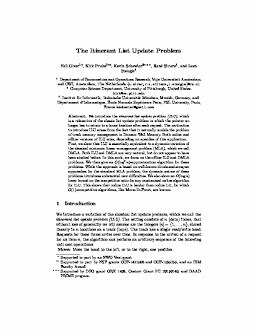 In this work, we focus on the offline ILU and DMLA problems. We then give an O ( log 2 ⁡ n ) -approximation algorithm for these problems. While the approach is based on well-known divide-and-conquer approaches for the standard MLA problem, the dynamic nature of these problems introduces substantial new difficulties. We also show an Ω ( log ⁡ n ) lower bound on the competitive ratio for any randomized online algorithm for ILU. This shows that online ILU is harder than online LU, for which O(1)-competitive algorithms, like Move-To-Front, are known.